We don't need a name to be the Best! 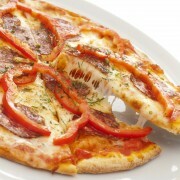 Mouthwatering pizza, pasta, chicken wings, garlic fingers, fish & chips, chicken, donairs & more! Gluten free pizza available. Order online from our website today! We make delicious pizzas & pizza slices with options for the meat, veggie & cheese lovers, french fries, poutine, chicken wings, nachos, donairs, garlic fingers & yummy bread. Check out our menu page! Buy one regular price pizza, get the second at half price. All day, everyday! Call Parkside Pizzeria now! Delicious pizza, great prices! Pick up or delivery! Pizza, Donair Pizza, BBQ Chicken Pizza, Oven Baked Wings, Donairs, Garlic Fingers with cheese & donair dipping sauce. Check menu page for specials! Mr. Jim's Pizza Restaurant and Lounge is open 7 days a week! Serving Mount Pearl, Paradise & surrounding areas. 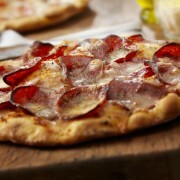 Check our menu and specials at www.mrjimspizza.ca. Call to order for pickup or delivery! 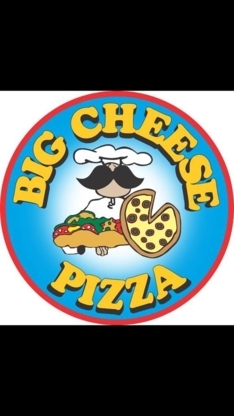 Pepperoni, anchois, beaucoup de fromage, hawaïenne; plusieurs choses à prendre en considération en cherchant la meilleure pizzeria à Conception Bay South NL. 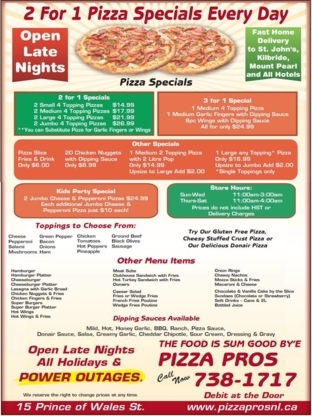 Avant de consulter le menu affiché à la fenêtre du restaurant de pizza ou de consulter un parfait inconnu que vous venez de rencontrer dans la rue, voici un petit guide pour trouver les meilleures pizzerias à Conception Bay South NL.